"I have been happily using Vicair wheelchair cushions for 16 years now!" 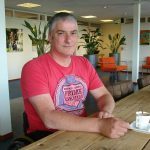 Marcel van Kleef was born in 1965 with Spina Bifida. Until the age of 14 he was able to walk with the help of braces and orthopaedic shoes. Then it was decided to surgically lock Marcel’s ankles. He was not allowed to walk in the year after the surgery. This weakened his leg muscles so much that he often needed to use a wheelchair. 1998 turned out to be a good and a bad year. Marcel became a father to a son, but in that same period it became clear that an amputation of his lower left leg was necessary. The treating physician could not find another solution to stop an infection in his leg. Since this amputation, Marcel uses his wheelchair permanently. Throughout the years Marcel had many experiences with a large variety of medical aids. 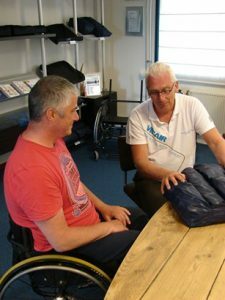 He sat on several types of anti-decubitus wheelchair cushions, before his physician at the Amsterdam Rehabilitation Centre introduced the Vicair cushions to him. Never change a winning team also seems to count for Marcels working career. He has been working in the Graphic Industry for many years now. He started at an offset printer and later became Desk Top Publisher after retraining. Today he is working as a manager of 15 employees at a copy shop with two shop locations. Recently Marcel started using a new type of Vicair cushion. It replaced the worn down Positioner that Marcel had been using for a large number of years. This new cushion, the Active, had just been introduced and was developed especially for active users like Marcel.